Getting started with the Speech Services is easy and affordable. A 30-day free trial lets you discover what the service can do and decide whether it's right for your application's needs. If you need more time, sign up for a Microsoft Azure account—it comes with $200 in service credit that you can apply toward a paid Speech Services subscription for up to 30 days. Finally, the Speech Services offers a free, low-volume tier that's suitable for developing applications. You can keep this free subscription even after your service credit expires. The 30-day free trial gives you access to the standard pricing tier for a limited time. Go to Try Cognitive Services. Select the Speech APIs tab. Under Speech Services, select the Get API Key button. Agree to the terms and select your locale from the drop-down menu. Sign in by using your Microsoft, Facebook, LinkedIn, or GitHub account. You can sign up for a free Microsoft account at the Microsoft account portal. To get started, click Sign in with Microsoft and then, when asked to sign in, click Create one. Follow the steps to create and verify your new Microsoft account. After you sign in to Try Cognitive Services, your free trial begins. 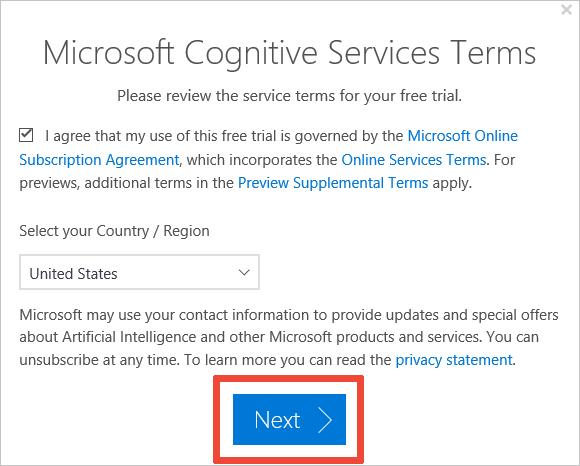 The displayed webpage lists all the Azure Cognitive Services services for which you currently have trial subscriptions. Two subscription keys are listed beside Speech Services. You can use either key in your applications. All free trial subscriptions are in the West US region. When you make requests, be sure to use the westus endpoint. New Azure accounts receive a $200 service credit that is available for up to 30 days. You can use this credit to further explore the Speech Services or to begin application development. To sign up for a new Azure account, go to the Azure sign-up page, click Start Free, and create a new Azure account using your Microsoft account. 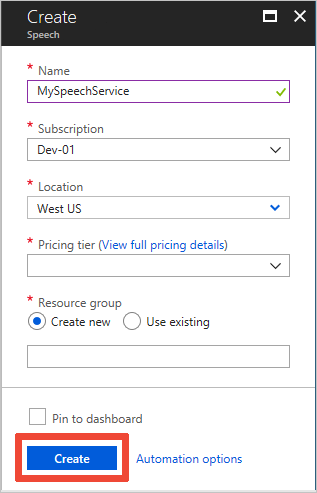 After creating your Azure account, follow the steps in the next section to start a subscription to the Speech Services. Sign in to the Azure portal using your Microsoft account. Select Create a resource at the top left of the portal. In the New window, search for speech. In the search results, select Speech. Under Speech, select the Create button. A name for the new resource. The name helps you distinguish among multiple subscriptions to the same service. Choose the Azure subscription that the new resource is associated with to determine how the fees are billed. Choose the region where the resource will be used. Currently, the Speech Services is available in East Asia, North Europe, and West US regions. Choose either a free or paid pricing tier. Click View full pricing details for complete information about pricing and usage quotas for each tier. Create a new resource group for this Speech subscription or assign the subscription to an existing resource group. Resource groups help you keep your various Azure subscriptions organized. For convenient access to your subscription in the future, select the Pin to dashboard check box. It takes a moment to create and deploy your new Speech resource. Select Quickstart to see information about your new resource. 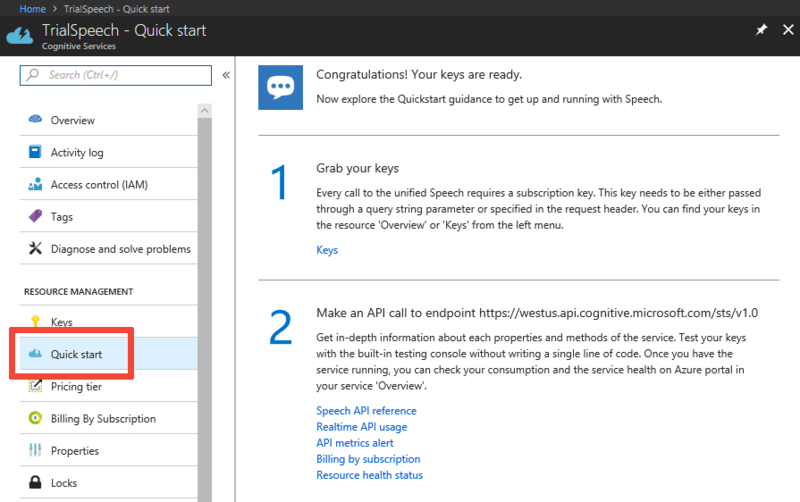 Under Quickstart, click the Keys link under step 1 to display your subscription keys. Each subscription has two keys; you can use either key in your application. Select the button next to each key to copy it to the clipboard for pasting into your code. You can create an unlimited number of standard-tier subscriptions in one or multiple regions. However, you can create only one free-tier subscription. Model deployments on the free tier that remain unused for 7 days will be decomissioned automatically. To switch from one subscription to another, for example when your free trial expires or when you publish your application, replace the region and subscription key in your code with the region and subscription key of the new Azure resource. Free trial keys are created in the West US (westus) region. A subscription created via the Azure dashboard may be in some other region if you so choose. 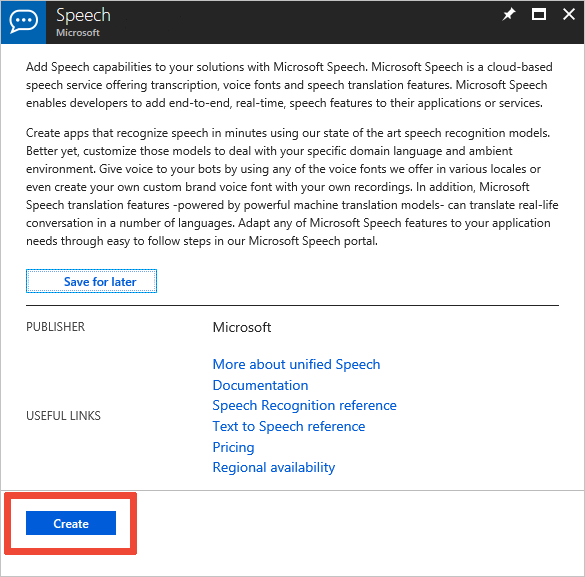 If your application uses a Speech SDK, you provide the region code, such as westus, when creating a speech configuration. If your application uses one of the Speech Services's REST APIs, the region is part of the endpoint URI you use when making requests. Keys created for a region are valid only in that region. Attempting to use them with other regions will result in authentication errors.